Democratic National Committee chair given second shot on national TV to clear up difference between Democrat and Socialist, and still can't. Democratic National Committee (DNC) chair Representative Debbie Wasserman-Schultz (D-FL) was given a shot at redemption on Sunday, when she was asked on national TV to explain the difference between a Democrat and a socialist, after being stumped when first asked last Thursday. Wasserman-Schultz was left sputtering and trying to divert attention to the Republicans in an interview with MSNBC host Chris Matthews last Thursday, in which the openly socialist Democratic presidential candidate Bernie Sanders was brought up and she was asked, "what is the difference between a Democrat and a socialist?" On Sunday, speaking with Chuck Todd on MSNBC's Meet the Press, she was shown the clip of her non-answer and asked to answer the question again. But shockingly, the DNC chair was still unable to give a coherent response, and after remarking on the "banter" with Chris Matthews she reiterated that "the important distinction that I think we’re going to be discussing is the difference between Democrats and Republicans." 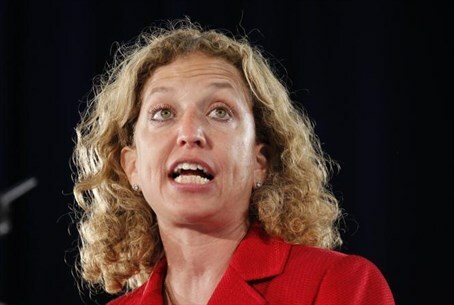 Instead of discussing the true nature of her party and what distinguishes it from far-let socialists, Wasserman-Schultz embarked on a vitriolic fusillade of talking points against the Republican party, accusing it of "extremism." Todd noted that the representative failed to answer the question, and tried to bring the question up again later with similar unsuccessful results. The topic is significant because Sanders is competing with Democratic presidential candidate Hillary Clinton, and has been enjoying a large amount of support from Democrats. A June Gallup poll found that 50% of Americans said they would not vote for a socialist, making it the demographic group with the least support, in a troubling sign for the Democratic party given Sanders's strong showing.